M&Ms The Sequel. This Time it’s Personal! Today I will be asking you to comment, not about a donation to charity as is my normal plea. Today I would like your opinion on the contents of this post. This is a follow-on from my previous post on M&Ms, link to the post here; I also include a brief summary below. In response to your email regarding M&M’S CHOCOLATE CANDIES. We’re pleased to hear you enjoy our M&M’S CHOCOLATE CANDIES and appreciate your taking the time to tell us so. Your comments will be shared with our Marketing Associates. Hmmmmmmmmm. I think they missed the point? Was I too reticent in my original post? I try to be balanced and perhaps that dilutes my message. In that case, let me be more clear…. Although there are no untruths in the packaging of a ‘Big Bag’ of Peanut M&Ms they are being sleekit. Definition – smooth in manner, plausible, sly, cunning – the perfect word in this case. Summarising the sleekitness, the ‘Big Bag’ shows a portion of M&Ms to be 45g and 232 calories as per the front of the bag. At no point is there a clear statement of the number of calories in the bag. If you had a quick look you assume there are 232 and not approx 360 calories in the bag. In my opinion this is deliberately done and that is wrong. We talk a lot nowadays about transparency, we talk about openness. We also talk about value for money during these lean times. We talk about understanding what we eat and teaching our children to eat healthily, balancing all food groups with the occasional treat. I believe that this kind of labelling goes against all of this. It is not open or transparent, I think it is an attempt to sell more candies by letting people think they are consuming less calories than the bag contains. I wonder why food manufacturers do this? I know we live our lives in a rush, everything is grab and go so that we can get on to the next thing. Why would anyone want to take advantage of this? Stop trying to hide price rises by making the product smaller and charging the same price. Prices are going up, this is not palatable for any of us. However, I feel more cheated when I know a manufacturer has reduced the packet size and charges the same price, when I know my crisps or chocolate bar has got smaller. Why not provide both? You are investing in different packing and this has a cost; why not have both and let the consumer make their own choice. Stop rearranging the shelves to disrupt customers’ routines. You say it allows people to see foods they wouldn’t normally notice, I say you are trying to get more product shifted through impulse buys. Remove the sweets from the checkout – this one has been irking parents and the weak-willed like myself for decades. When a customer takes some of their time to provide feedback do not take the compliments and ignore anything that could be perceived as criticism. I was quite gobsmacked at the reply from Mars. Yes, I said how much I loved M&Ms but surely my use of the phrase ‘sleight of hand’ could have been at least acknowledged? Sending my feedback to the Marketing Associates does not make me feel that my comments will be given any consideration, let alone serious consideration. 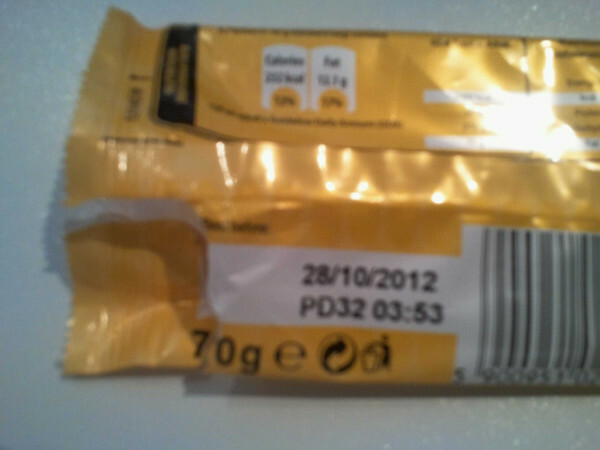 So, today I ask you to comment on this blog to tell me how you feel food manufacturers and retailers get up your nose. Do you agree with me? If so please let me know, if not then please let me know. If there are other bug-bears that I have missed please let me know. I want to have comments attached to this post so that I can send this on to the Mars Company and see if they have any further comment to make…. Mmmmmmmmmm, no pun intended. I will be honest and say when it comes to a peanut M&M I can happily ignore the calories but will check how many calories I will consume in half a tin of beans. However, I read. I read everything, including the back of a packet of sweets. 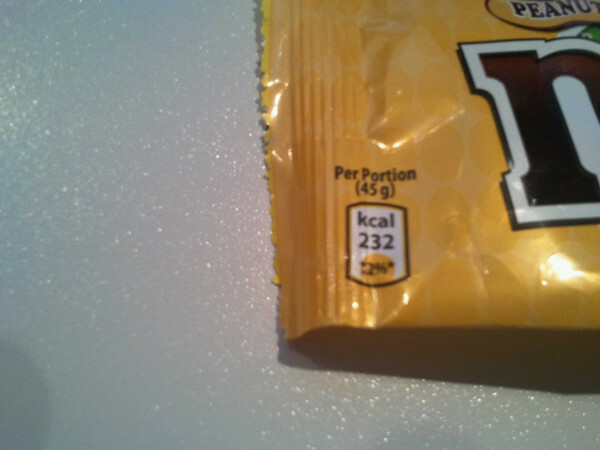 The packet of M&Ms was not lying to me, there are 232 calories in a 45 g portion and I ate a 70 g ‘big bag’. To work out the calories I actually consumed you divide 232 by 45 and multiply the result by 70 – approximately 360 calories. I am able to do sums as well as read…. I say again, there are no lies on the packet. However, there is what I would term a sleight of hand. If you just look at the front of the bag you could easily assume you are consuming 232 calories. We talk a lot about educating children about the food they eat, we encourage them to balance their proteins, carbohydrates and 5 portions a day with occasional treats. I hope children are also being educated to look closely at the small print on the bags of their daily treat when sweet manufacturers are displaying this kind of information. I would have been happier if the bag was 90 g, you could say it was two portions? Added to this I googled M&Ms before I started this post. When you go on the official site you get the following message – ‘As a responsible manufacturer, we need to check your age to ensure that we adhere to our commitment to market our brands responsibly’. You are then invited to enter your MM DD YYYY date of birth. I nearly choked when I read this. As it says on the title of this post I do not want to pick on M&Ms. I will continue to snaffle them frequently and not worry about the calories until much later. I could start on the supermarkets where you can buy one tin of Product A for 50 pence whilst above that (at eye level of course) there is a four-pack of Product A with a big sign saying ‘Great Value, Four for £2.20’. That also irks me. I just want to remind everyone to read. Read the packets. Encourage your children to read the packet. Let them see what the real world of treats and sweeties is about. Let them enjoy a treat but let them see the calories consumed……. PS – I contacted the manufacturer and sent them a copy of this post too….